How will our cities look in 2050? Is Eindhoven still the most innovative city and what is the role of design in shaping the city and its identity? With the title City of the Future the Dutch Flemish house deBuren organised a series of debates to sketch future city scenarios. In Eindhoven we will specifically discuss the role of innovation and design based on 3 future scenarios presented by leading experts in the field. The debate will also challenge the audience to sketch future scenarios and interact with the audience in a designerly way. The discussion kicks off with moderator Nathan de Groot presenting utopian and dystopian ideas from the past. Already a century ago people dreamed of flying cities, indoor cities and they questioned the role of architects, by visualising an automatic building process. “What is clear, is that we overestimated the power of machines at that time”, mentions De Groot. At this debate we will present future scenario’s, looking at 2050 with a team of acknowledged experts that each will speculate about the future. 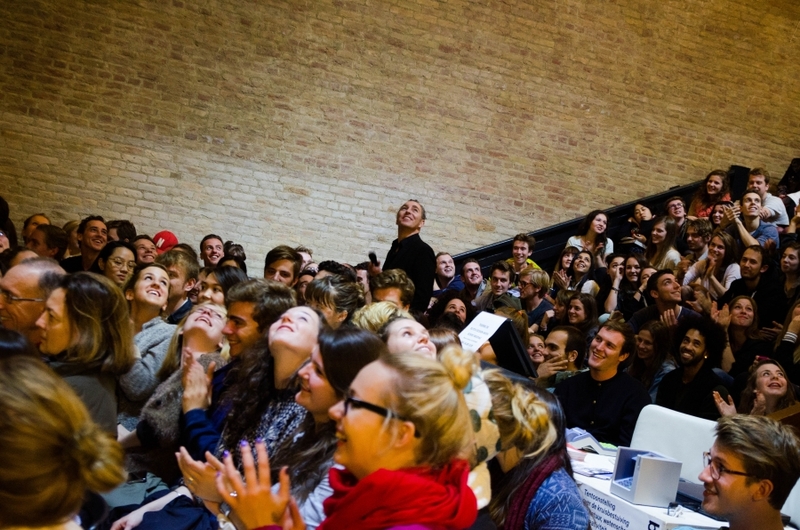 a research group, think tank for urban futures at the faculty of architecture at Delft University. De Why Factory is linked to the architecture agency MVRDV. In the Why Factory students work side by side with professionals on what if scenario’s, looking at the role of technology or societal trends like bottom up initiatives. To exemplify this approach, Ulf Hackauf brings up the Anarcity project that questions when we need our neighbour? In the project students questioned how autonomous people could live and when they needed neighbours to collaborate. 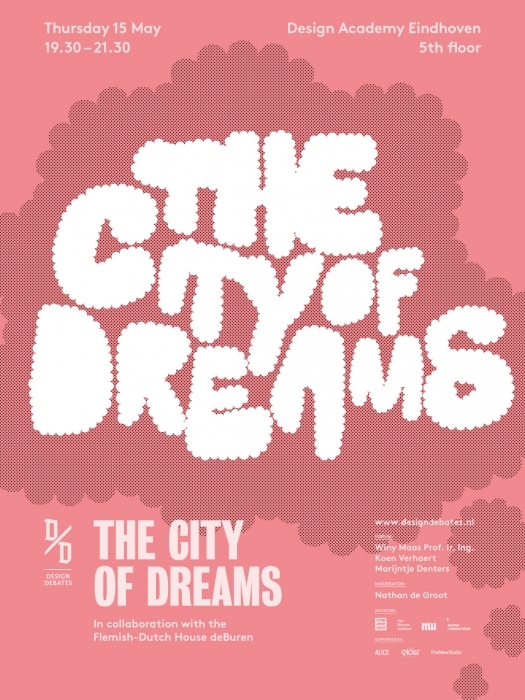 Another project that Hackauf brings up is the Barbapapa city, inspired on ambient technology. What would happen if the environment would react to you; if it would be shaped around you like a Barbapapa figure that can be shaped around almost anything.? What if you apply this to architecture? Hackauf presents an impressive movie that visualises how a shower can be shaped into a pool and where houses are constantly changing according to the realm of individuals. What will this mean for future cities? Will we face constantly changing cities where the distinction between city and nature will be completely blurred? Koen Verhaert gives a presentation on DIY city planning, or the democratisation of urbanism as he frames it. Verhaert who was born in Antwerp has the Dutch nationally and reflects on the differences between Belgium and the Netherlands. “In Belgian building your house is a very individual thing. It’s a co- creation process between yourself and an architect. Besides they love stand- a -lone houses. As for Verhaert we see a democratisation of innovation, more and more people get involved in the innovation process. That certainly has an impact on cities. After the presentation there is a forum discussion on the question if you can design a self regulating system that prevents that bottom up initiatives in cities become a sprawl? Koen Verhaert is sinds 1997 actief binnen VERHAERT. Dit bedrijf helpt ondernemingen zoals Stryker, Coca Cola en Ab-Inbev bij productinnovatieproces; van strategie tot uitvoering.Koen Verhaert doceerthet Master-na-master programma Innovatie en Entrepreneurship aan de AMS (Antwerpen Management School). Hij is tevens auteur van het boek Het verhaal achter nieuwe producten. Marijntje Denters is researcher voor verschillende programma's van de VPRO, waaronder Tegenlicht en Zomergasten. Voor Tegenlicht deed ze onderzoek naar mogelijke toekomstscenario's voor de stad, wat resulteerde in Making Cities: de stad van de toekomst. Nathan de Groot is urbanist/journalist/optimist. Nathan nam in 2012/13 deel aan de post-graduate opleiding van het Strelka Instituut voor Media, Architectuur & Design in Moskou. Hij schreef voor The Pop-Up City en won met een internationaal team de Vision Competition van de Tallinn Architecture Biennale met een toekomstvisie voor stadsdeel Väike-Õismäe. Ulf Hackauf is a teacher and researcher at the Delft University of Technology. He is also is a member of the Why Factory (T?F) : a global think-tank and research institute, run by MVRDV and Delft University of Technology and led by professor Winy Maas. It explores possibilities for the development of our cities by focusing on the production of models and visualisations for cities of the future.